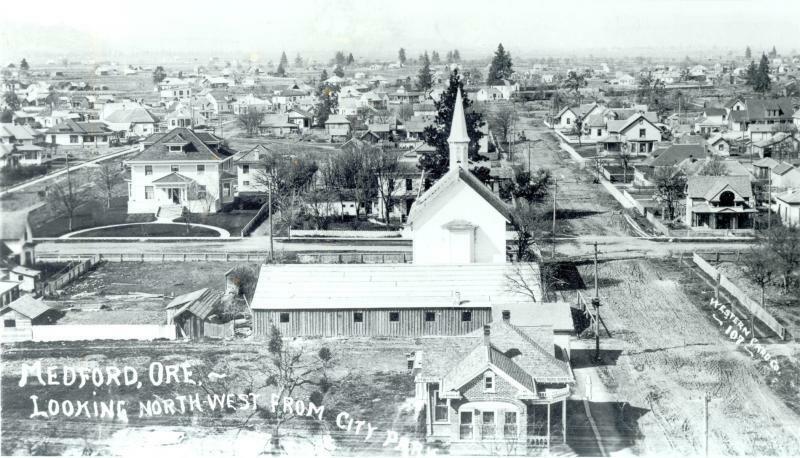 The first Episcopal Church in Medford was erected in 1889 on the northwest corner of West Main and Holly Streets. It was a small frame building that stood under a large oak tree and had a board walk leading up to its door. Mr. C.C. Beekman, the Jacksonville banker, donated the lot on which the church was built. It cost about $350 and served southern Oregonians for about 20 years. In 1909 the Episcopal Church decided to build a building on West Main Street. Vestry notes record the decision to build “a handsome gray granite edifice,” the purpose of which was to serve as an investment and as a church. The original church was later sold to the Presbyterians for use as a Sunday School room. The new building was ready for occupancy in 1910 and St. Mark’s became incorporated on September 15, 1911. Services were held on the second floor of the new building, which had an altar at the end of the hall. These were hard times and the altar at the end of the hall was often shut off and the hall rented out for dances or anything that would bring in money for the struggling parish. The Masonic Lodge bought St. Mark’s hall in the spring of 1920 for $25,271. The Lodge granted permission to St. Mark’s to use the hall and dining room for meetings. In 1913, a full time rector was assigned to St. Mark’s. Needing more appropriate church quarters, it was decided to build a church on the adjoining lot, behind the big granite edifice. The foundation of the church was laid but the project was abandoned when the opportunity to acquire a better site was presented to the Bishop’s Committee (forerunner of the Vestry). On September 21, 1920, the lot and foundation were sold to the power company for $2,874. The preferred site for the new St. Mark’s Church was located on the southeast corner of North Oakdale and Fifth Streets. St. Mark’s Church was erected at a cost of approximately $5,000 and the first service was held on December 17, 1916. The church functioned as an organized mission for almost nine years before becoming a parish. A parish house , later named the Guild Hall, was built and the first annual meeting was held there on November 21, 1923. The church attempted to become a parish several times in 1925 but was refused due to problems such as delayed paperwork and an outstanding debt of $500 owed to the diocese. St. Mark’s had $32 in its treasury at the time, out of which $20 was paid to the diocese. The Bishop paid $100 and a special plea for an offering of $380 was made. The church was consecrated on November 29, 1925 and the parish was organized and admitted into union with the Diocesan Convention on January 31, 1926. War and a large number of service men stationed at Camp White in the early 1940s created many demands for services and facilities in the valley. St. Mark’s did its part by providing a recreation hall and enlarging the church at a cost of about $21,500. The building was christened “The Markade” on January 3, 1943, indicating the aid St. Mark’s was giving to the soldiers. The Markade was closed by September 1945 after the end of the war. The Guild Hall was demolished in 1967 along with the Christian Science Church which St. Mark’s had purchased. The first Sunday School was organized in 1890 and held in the little frame church on the corner of Main and Holly Streets, later moving to the handsome gray edifice. Sunday School was held in the nave of the new church for several years and in the Guild Hall after it was built in 1922. Reports at the end of 1949 show an enrollment of 220 pupils. During the 1950s the enrollment was well over 400 in two different years and remained in the high 300s. In June 1954, the Wells Organization was retained to perform a Building Fund and Budget Canvass for the purpose of raising funds needed to purchase property and erect a new church school building. The Wells Organization was paid $4,200 and raised $109,813. The new property was purchased for $40,000, including the old Christian Science Church, which became known as “St. Mark’s annex” and was used as a nursery, for small meetings and storage. A two story building to house the Church School and the Rector’s office was dedicated on September 16, 1956 and named Dagwell Hall, in honor of Bishop Dagwell. The Parish Hall (formerly the Markade), and the church were extensively remodeled in a project completed in 1969, which included the demolition of the Guild Hall and St. Mark’s annex. The project cost $90,000 and included the addition of the concrete courtyard. Adapted from “A History of St. Mark’s,” compiled by Katherine Nealon Huntress Leavitt, 1970.